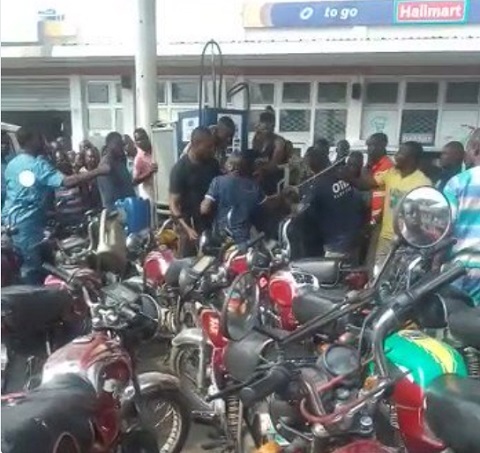 The rowdy atmosphere in filling stations across the country has brought about different kinds of drama, TheCable reports. While some people end up not getting fuel after several hours in the queue, others run out of patience and vent anger on those around them. On Saturday morning, a fight broke out between motorists at an Oando fuel station along Agege Motor road in the Mushin area of Lagos. A frustrated motorist had lamented that the station had been unable to effectively manage the hundreds of people who assembled at the station since 5am. He shouted on top of the voice and refused to be persuaded. In annoyance, one of the soldiers stationed to maintain law and order brought out his whip and started flogging motorists and those around.